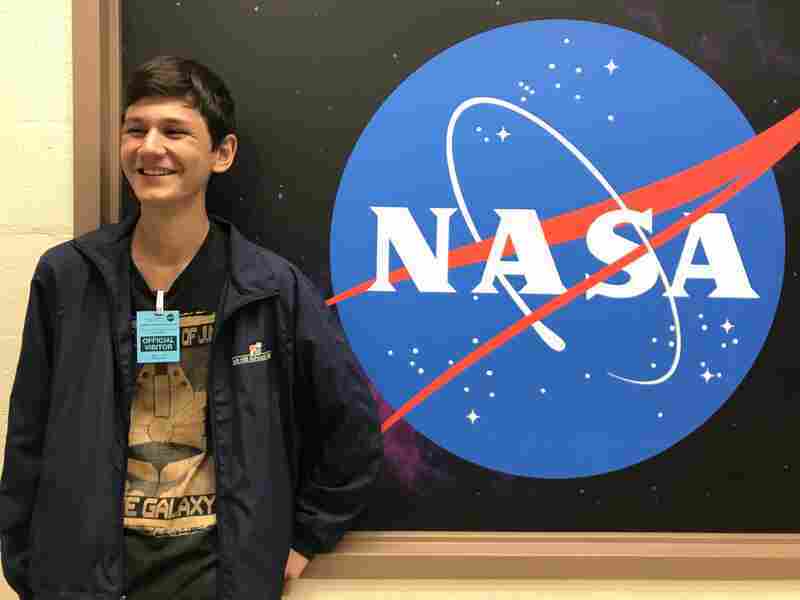 Young Astronaut Hopeful Gets NASA Tour Of His (Space) Dreams Murad Rahimov got to see the inner workings of NASA's Goddard Space Flight Center after an NPR listener learned of his passion for space. Murad is obsessed with space. He has been ever since he was three, back in his home country Uzbekistan. His young imagination was sparked when his aunt gave him a picture book about space, and he couldn't stop looking at the images of the solar system. Soon after, he told his parents his dream: He wanted to become an astronaut and work for NASA. On this recent day, he was getting a private tour of NASA's Goddard Space Flight Center in Greenbelt, Md., thanks to an NPR listener who heard about Murad's passion for space in a story that aired earlier this year. In January, NPR profiled the Rahimov family on the day they became naturalized as U.S. citizens. The Rahimovs immigrated to the U.S. from Uzbekistan in 2010, when Murad was nine. When they first landed in Kansas City, Murad spoke no English. Now, heading into his junior year of high school, he's on an accelerated track, taking extra classes in the summer and packing his schedule with AP courses. Listener Aaron Schnittman heard that story on the radio, and his ears perked up when he heard that Murad's goal is to work for NASA. He emailed NPR that same day, that his brother is a research astronomer working for NASA at Goddard. "I think it would be a cool follow up to connect the son to my brother and help him make the connections needed to pursue studies in astronomy," he wrote. Cool, indeed. 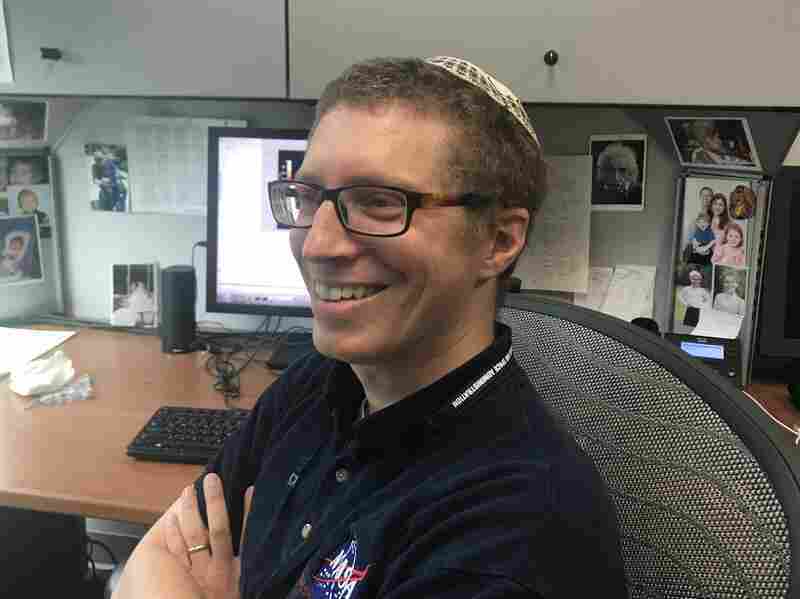 The connection was made, emails were exchanged, and last week, at the invitation of Jeremy Schnittman, Murad and his mother, Limara Rahimova, made the trip to Goddard outside Washington, D.C. Schnittman, an astrophysicist who specializes in black holes, spent several hours showing the Rahimovs the inner workings of the space flight center and sharing his enthusiasm for space science. Murad was clearly in his element, sporting a t-shirt with a picture of the Millennium Falcon spaceship from Star Wars, and a line from the movie: "the fastest hunk of junk in the galaxy." 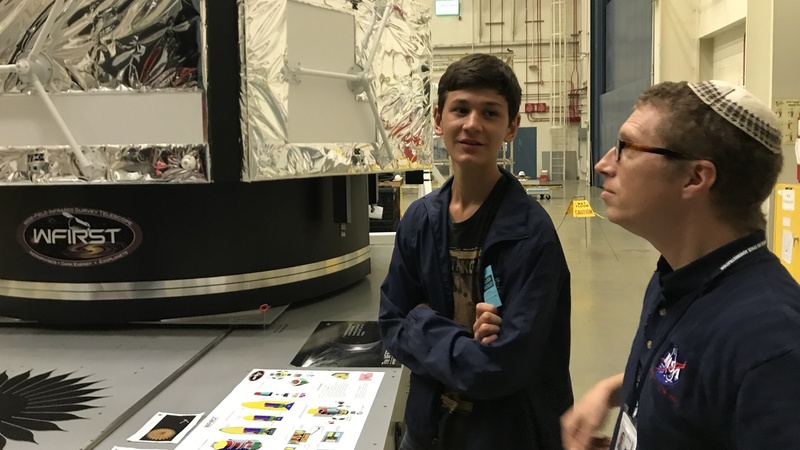 He and his mother got to see the giant cryo-vac chamber where spacecraft are tested to find out if they'll withstand the extreme temperatures of space. They walked inside the acoustic chamber that blasts spacecraft with earsplitting sound to simulate the vibration of launch. They toured the laser lab where scientists are fine-tuning measurements to detect gravitational waves. "Amazing," Murad marveled. Jeremy Schnittman, an astrophysicist who specializes in black holes, spent several hours with Murad and his mother. Back in his office, ("black hole central," as he calls it) Schnittman talked with Murad about his research into how light gets bent around black holes. Naturally, they both share a hero in Albert Einstein, whose photo Schnittman keeps pinned above his desk. "It's remarkable," Schnittman said. "It's over 100 years since Einstein did all of this stuff, and still, everything is Einstein. Einstein, Einstein, Einstein." When Murad mused about the possibilities of time travel, Schnittman sounded optimistic. "It's really not that much of a stretch to say that we're one step closer to time travel," he told Murad. "This is something that Einstein predicted 100 years ago. According to the theory, the equations, time travel should be possible. The trick is just building it and getting it to work, but as far as we can tell, there's no rule against it." The astrophysicist and the would-be astronaut parted ways with the promise to stay in touch. Murad touring NASA's Goddard Space Flight Center with astrophysicist Jeremy Schnittman. Later Murad said he loves science because it shows "the sheer awesomeness, the sheer scale of how insignificant and alone we are in the universe. All these petty fights that people have between themselves, they are just insignificant. When you start thinking about space, you get lost in the vastness of it. That's what captivates me the most." Now that he's a U.S. citizen, he believes his dream of becoming an astronaut is more within reach. He and his brother automatically became citizens when their parents did. Murad was at school the day they took the oath: "I came home and looked at my parents, and felt all this pride," he said. "You could sense that something has changed. They were smiling from ear to ear." For his mother, Limara, becoming a U.S. citizen has grounded her in a new way. "I felt before like I'm between countries," she said. "But now I feel like I'm staying ...both my feet here in this land." Limara works at a school, and each morning they all stand for the pledge of allegiance. Before, she said, "it didn't touch me. But now, yes! And I know what each word in the pledge of allegiance means. And it means, for me, a lot." As for Murad? The rising high school junior has his sights set on going to Cal Tech, and on the Mars mission he dreams of one day leading. "Some people, they tell me to try to get a real job," he said, "of maybe not shooting so high. But nah. I'm shooting for it. I'm gonna chase my dreams." Meantime, there's a celestial show about to happen, one he's been excited about for years: the total solar eclipse. Murad's hometown, Kansas City, is a perfect spot to see it: right in the path of totality. Next Monday he will be outside, watching in awe as the moon slides over the sun, and dreaming big dreams of space.